1. Dogs and cats become aware of each other's existence (through the kitchen window or by watching My Cat From Hell on Animal Planet, for example). 2. 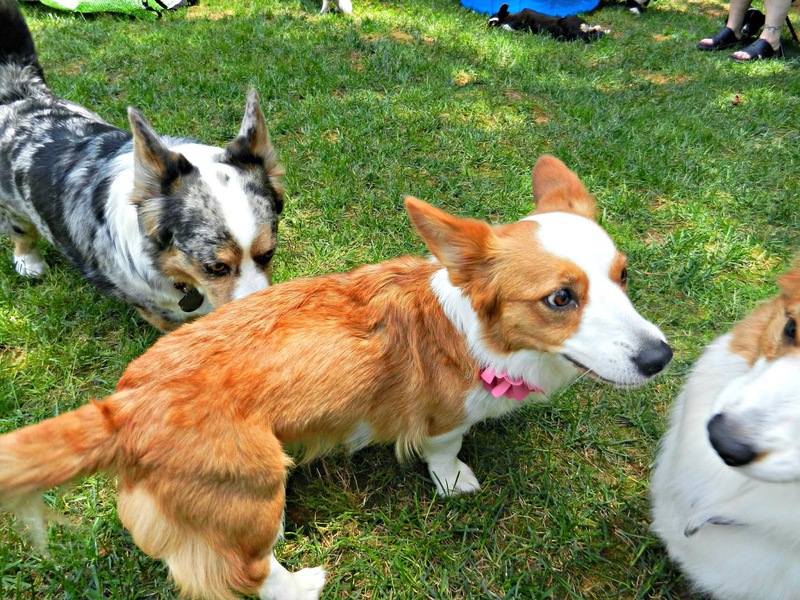 Dogs and cats become aware that they are currently living with a member of the other species, though they have not laid eyes on one another. For example, they can smell and/or hear weird "alien" animal smells/noises coming from another room. Here is an example of the THIRD kind of interspecies encounter. Now tell me, WHAT IN THE WORLD is going on in that picture up there?! A. The foster kitten challenged Jon Farleigh to a duel during lunch, in the shower, and Jon Farleigh was too ashamed to decline. B. Jon Farleigh ran into a running shower to escape 3.5 collective pounds of menacing (alien) foster kittens, who - as you can see here - are not going to be thwarted (as normal cats should be) by mere liquid hydrogen and oxygen. C. This is a snapshot from when Jon Farleigh told a tall tale to a bunch of "puppies," recounting the time he was attacked by freakish kitten mutants who wanted to eat him off of a silver platter. 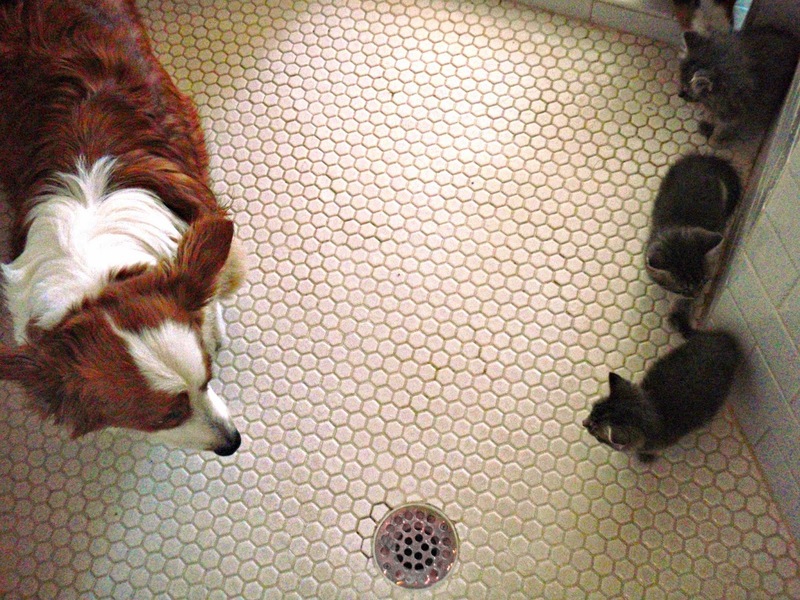 D. Jon Farleigh followed the foster kittens into the shower, mistaking them for furry candy dispensers. E. Both B and C.
Leave your guess in comments or on the Facebook page! * Because in deciding to go with the Close Encounters pun/parody post title, I needed to school myself on the reasons behind Steven Spielberg's choice of movie title. Otherwise, the pun might have been inappropriate (it isn't), and therefore, the bane to Spielberg movie buffs' existence. Please note, you might have just wasted 23 seconds of your life reading this, if you've never seen the movie in the first place. Also, it's impossible to "unhear" this film score. B. "Jonathan Farleigh! I told you three years ago that I'm not interested in your roomie that way! So, call him off, bro. Call that sniffy-feely blue boy OFF!" P.S. There's a long "history" between Dewi and Georgia (if you're new to the blog, or suffer from long-term memory loss). It all started here, and officially ended here. 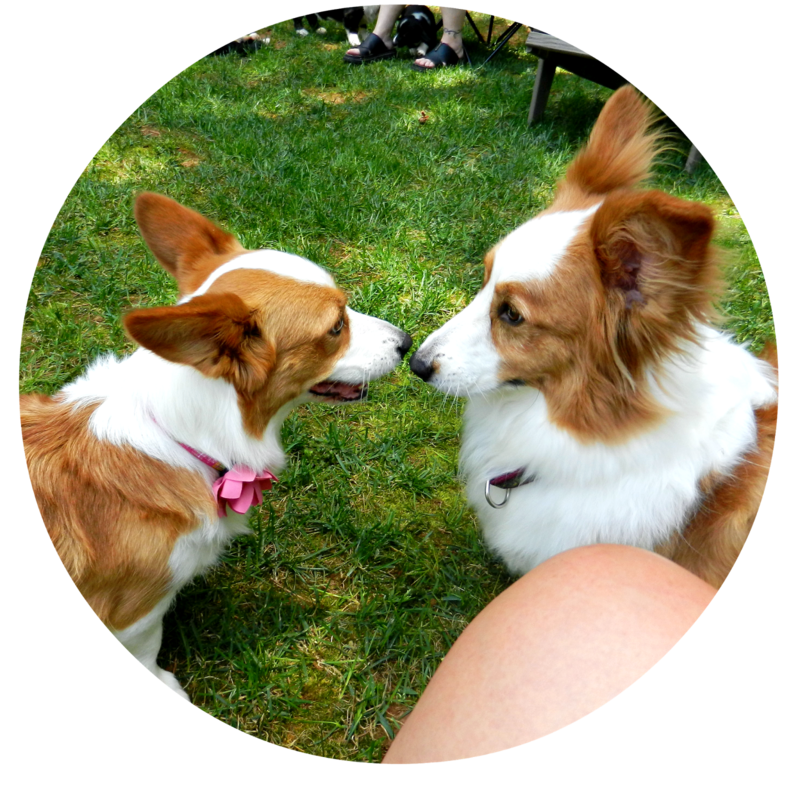 LOTS of corgis (and silliness) in those two posts! BOL BOL funny was b and c so we go for e. Have a terrific Tuesday.